(CNSNews.com) – The $716 billion defense bill signed into law by President Trump on Monday includes a provision that will require outlets like Qatar’s Al Jazeera for the first time to start reporting regularly on its funding and ownership. The television network has long been in the crosshairs of conservatives in the United States. A bipartisan group of lawmakers pressed the Department of Justice last March to order Al Jazeera to register under the Foreign Agents Registration Act (FARA), citing “radical anti-American, anti-Semitic, and anti-Israel” content. 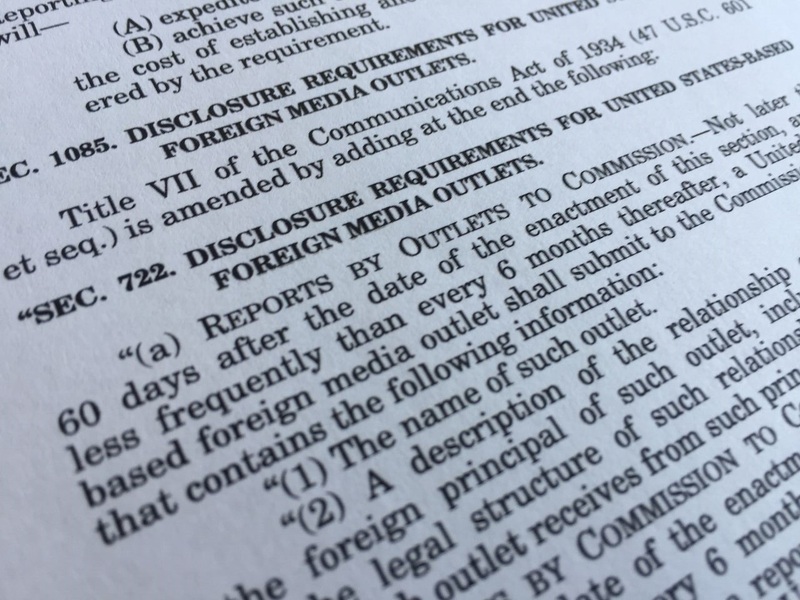 The National Defense Authorization Act (NDAA) for fiscal year 2019 requires U.S.-based foreign media outlets to report to the FCC within 60 days – and then twice yearly thereafter – on their relationship to and funding by “foreign principals,” that is, foreign governments or political parties. The FCC must report the information to Congress and post it on its website. Based in Doha, Al Jazeera is a subsidiary of the Qatar Media Corporation, which is owned by the government of the small Gulf state. Qatar is a purported U.S. ally but one whose foreign policies – including support for the Muslim Brotherhood and U.S.-designated foreign terrorist organization Hamas – have drawn criticism from the U.S. and sparked a major rift with its Gulf neighbors. In a letter to Attorney General Jeff Sessions last March, 19 Republican and Democratic lawmakers urged the Justice Department to look into whether Al Jazeera should be required to register as a “foreign agent” under FARA. “We find it troubling that the content produced by this network often directly undermines American interests with favorable coverage of U.S. State Department-designated Foreign Terrorist Organizations, including Hamas, Hezbollah, Palestinian Islamic Jihad, and Jabhat al-Nusra, al-Qaeda’s branch in Syria,” they wrote. “American citizens deserve to know whether the information and news media they consume is impartial, or if it is deceptive propaganda pushed by foreign nations,” the lawmakers argued. The initiative was led by Reps. Lee Zeldin (R- N.Y.) and Josh Gottheimer (D-N.J.). Other signatories included Sen. Ted Cruz (R-Texas) and members of the House Homeland Security Committee, Reps. Peter King (R—N.Y.) and John Ratcliffe (R-Texas). Al Jazeera press office did not respond to queries about the implications of the NDAA provision by press time. The FARA is a pre-World War II-era law requiring agents representing the interests of a foreign power to disclose their relationship as well as financial and other information. Not many media organizations are currently registered. Those that are include the English-language Chinese outlets, China Daily and People’s Daily Overseas Edition, the Korean broadcaster KBS, and Japanese broadcaster NHK Cosmomedia. Last November the DOJ determined that RT America, the pro-Kremlin broadcaster previously known as Russia Today, register under the FARA.